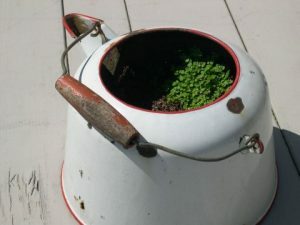 Pots and planters can be an expensive item if you’re planning on venturing into container gardening. Instead of heading to the garden store, or the warehouse stores, think creatively. When you realize that you can put a plant in almost anything that holds dirt and has some sort of drainage system, the possibilities for inexpensive container gardening grow exponentially. Plastic Buckets – Any size will work. The only thing you need to do is to punch some holes in the bottom or sides (if that is easier). 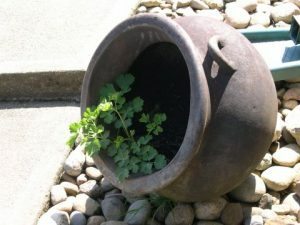 Black buckets will hold the heat more which is great for northern gardens, but might not be recommended for warmer climates. 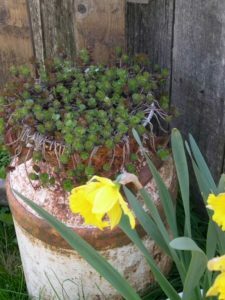 Old Tires – I love using these to put my rhubarb plants in. I keep stacking tires on them as the stalks get longer forcing them up to the light. Again, the black tends to hold heat and act like a greenhouse of sorts for my plants. Rolls of Wire Fencing – Simply make a tube, wire shut, cut to the height you want and then fill with dirt & mulch. This is a wonderful way to grow potatoes and if you keep covering up the plant, your veggies will be above ground when it’s time to harvest, eliminating the digging. Now, if you’re looking to add some interest to your garden or things that are a tad more decorative than an old tire, start by using your imagination. I’ve included some pictures of things I’ve used in my garden that aren’t typical “planters,” but work as such. My easy to implement rule is if I can get some dirt into it, it’s a planter! 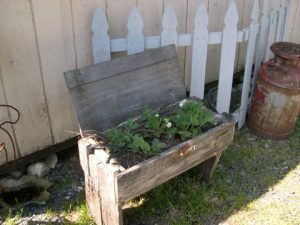 If you are not sure what might be planter possibilities you’d like to add to your garden, begin by walking around your property or digging around in the garage or shed. Look for old containers under your kitchen sink, even plastic dish pans would work. Broken pots can be tipped over in the dirt and used to “frame” a plant like it’s spilling out. Cracked bird baths can be given a new job with some dirt and a layer of lush Baby Tears. Another place that can bring container inspiration are local thrift shops and neighborhood garage sales. You can find countless treasures in these places and many of the items I’ve found when searching there have now found a home in my garden. Remember, if it holds dirt, it’s a planter! 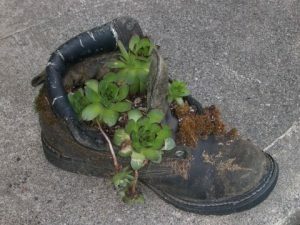 A tradition began in my garden when one of my kids moved out, leaving her old gardening shoes for me to dispose of. She mentioned, “You could always plant in them” and that7s exactly what I did. Her shoes were such a hit, we then required kids that were leaving, to donate a pair of shoes to the gardens (since I have taken care of foster kids over the years, needless to say, there are lots of shoes scattered around the property). 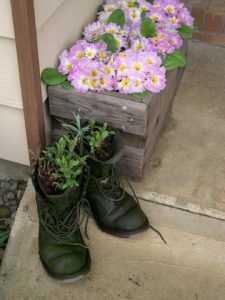 My favorite has to be my dad’s last pair of work boots which my mom brought to my gardens after dad died. They are planted with forget-me-nots and located at my front door.